4. Pancreatic Cysts: Sinister Findings or Incidentalomas? 10. Colorectal Cancer Screening: Is Colonoscopy the Best Option? This issue of Medical Clinics, Guest Edited by Dr. Kerry B. Dunbar, is devoted to Gastroenterology. Articles in this issue include: Proton Pump Inhibitors: What the Internist Needs to Know; Management of Refractory GERD; Colonoscopy, Polypectomy, and the Risk of Bleeding; Pancreatic Cysts: Sinister Findings or ‘Incidentalomas’? ; The Future of Non-Alcoholic Fatty Liver Disease Treatment; Effective Treatments for Irritable Bowel Syndrome; The Revolution in Treatment of Hepatitis C; Diet and the Role of Food in GI Symptoms; Eosinophilic Esophagitis; Colorectal Cancer Screening: Is Colonoscopy the Best Option? 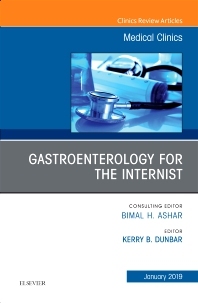 ; Celiac Disease and Gluten Sensitivity; Management of Chronic Pancreatitis; and Helping Patients with Gastroparesis.